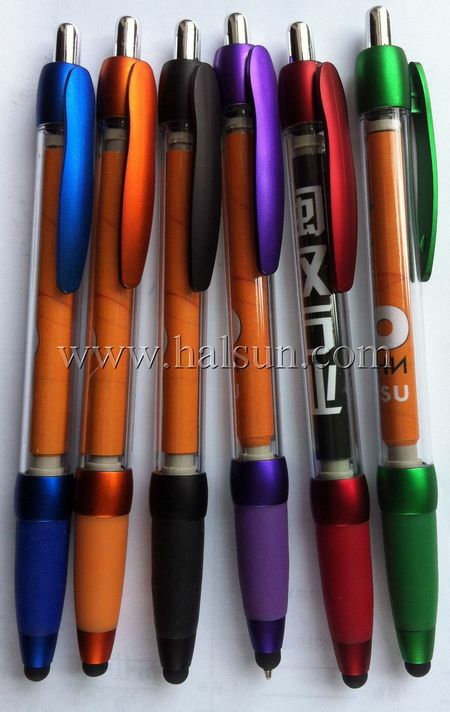 Metal Banner Pens. Custom Offset Imprint. Free Shipping & No Setup Charges,4 weeks to your door! 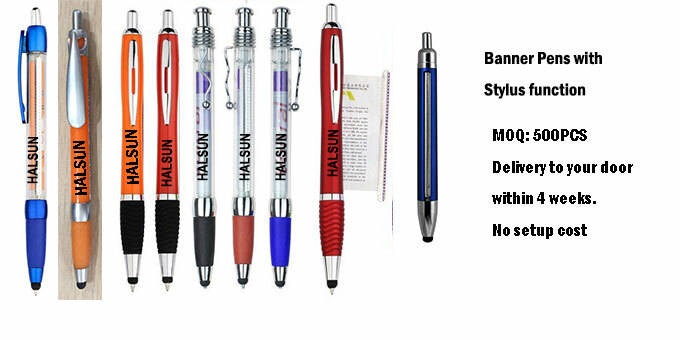 Metal Banner Pens with Stylus. Custom Offset Imprint. Free Shipping & No Setup Charges,4 weeks to your door! Banner Pens,Custom Scroll Pens/Flag Pens,Church Pens, Trade Show Pes,HSBANNER-9,Free Shipping & No Setup Charges,4 weeks to your door! 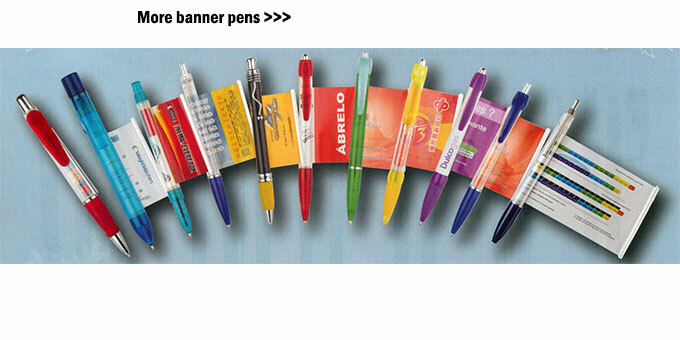 Stylus Banner pen combo are perfect to promote your business. Smooth both on paper and screens. Write down the idea come into your mind with our banner stylus. At the same time a 168*68mm banner of your company/products information is carried with the banner stylus. Size : 14.9 cm x 1.2 cm diam. Colrs Imprint : Any PMS on Imprint of Clip or Barrel (if applicable). Banner is full color digital. Metallic trim gives the pen a sophisticated look. Colored rubber comfort grip makes writing with the medium point black ink easy. An integrated black soft stylus on the tip of the pen works only with capactive touch screens on smartphones or tablets when the pen is being held by the comfort grip. Great for writing down notes, filling out reports or signing documents. Your price includes a full-color imprint on both sides of the banner. 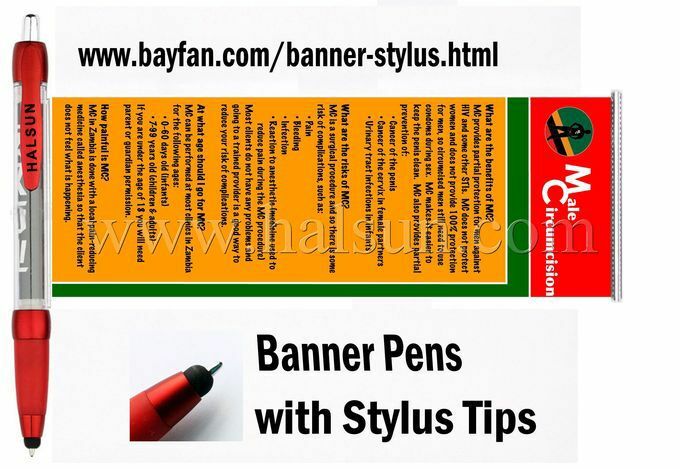 Order your customized banner stylus pens at bayfan.com! Delivery time will 4 weeks to your door by courier like DHL/Fedex/UPS/TNT. If you are in hurry, we also offer 15-days urgent delivery service.